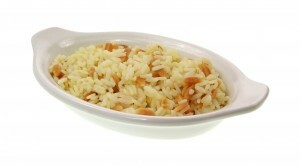 Rice-A-Roni, the San Franscisco Treat….well, not for those with milk allergies anyway! Rice-A-Roni has recalled a small quantity of Rice-A-Roni Rice, Pilaf flavor, due to an undeclared milk allergen. The affected Rice-A-Roni is limited to the 10.8 ounce family-size boxes, with the UPC Bar Code ending in 43004 and are stamped as Best Before Date of JUL 30 12 B on the bottom of the box. This product was originally distributed to stores in California and Arizona. People who are allergic to milk run the risk of a serious or life-threatening allergic reaction if they consume this product, and as such, should return it to the retailer where it was purchased for a full refund. No other Rice-A-Roni or Pasta Roni products are affected. People who do not have milk allergies can eat this product without concern.